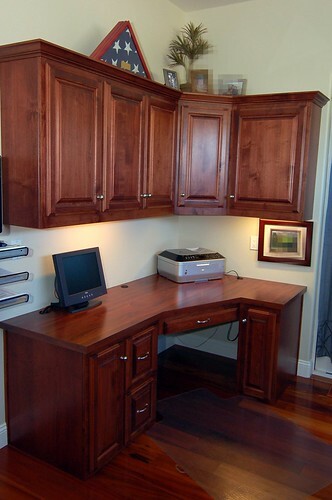 Here is a photo of a recently completed home office. The homeowner was looking to match the richness of the home’s flooring while gaining a durable work surface that would stand up to the rigors of daily use. We achieved this with a stained select alder cabinet, matched to a WilsonArt laminate countertop. This premium laminate has a woodgrain texture that complements the texture of the raised panel doors very well.